Affiliation – we are a part of the Baptist Churches of Western Australia. 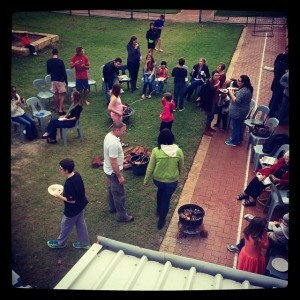 We have been around since 1996 as a church and we are connected with the Quinns Baptist College community. The school was started by the church, but now, while they are independent entities they still try to work closely together and have a healthy relationship. Beliefs – we believe all the usual stuff you’d expect for a Baptist church – no big surprises here. We like it this way and we encourage people to think about faith and respect each other’s different points of views. We won’t tell you how to vote and we won’t tell you what to think – but we will encourage you to think. The Vibe – I guess you could call this our ‘culture’ or ‘values’. We don’t have a written list of vision, mission and values, so this is more of a description of the kind of people we aspire to be. Most of what matters to us is authenticity, simplicity and integrity – a simple expression of church, big on relationships and seeking to help everyone find their way to a genuine relationship with Jesus. We think its important for families to be in church together so our kids spend at least half of the Sunday service with us before heading out for some more child friendly teaching. That means it gets a bit noisy from time to time – but then that’s how it is with families… We’d rather have the kids with us and learning about worship from other families than siphon them off into a space away from the family. We don’t have a lot going on by way of programs and that is intentional – we don’t want to be a busy church. That said if we see something worth doing then we will be onto it and making it happen. We like to camp and do things together, so occasionally we will cancel Sunday because we are away for the weekend. While we like to keep things simple we don’t mess around when it comes to discipleship. If you sign up with QBC expect to be both encouraged and challenged. Expect to share your life with people and be honest about your struggles. QBC isn’t a place to come and ‘hide’. All of our pastors are part time and we like it that way too. It means we have a diverse leadership team and we have people grounded in the rest of the world. It also means our pastors aren’t always available so the church has do its thing of being a proper community who look out for each other and don’t rely on paid staff. We usually do that pretty well. If that sounds like a community you’d like to be a part of then come along and join in.